which free antivirus program is best of these three? Is anyone else having problems with yahoo messenger ? Where can I find a really strong shovel? what is eating the dead mice in my mouse trap? Poll: Would you rather be covered in cream or chocolate......? “Orla C” wrote “Yes we do, and by golly there are trolls everywhere else. Which one was your mother? 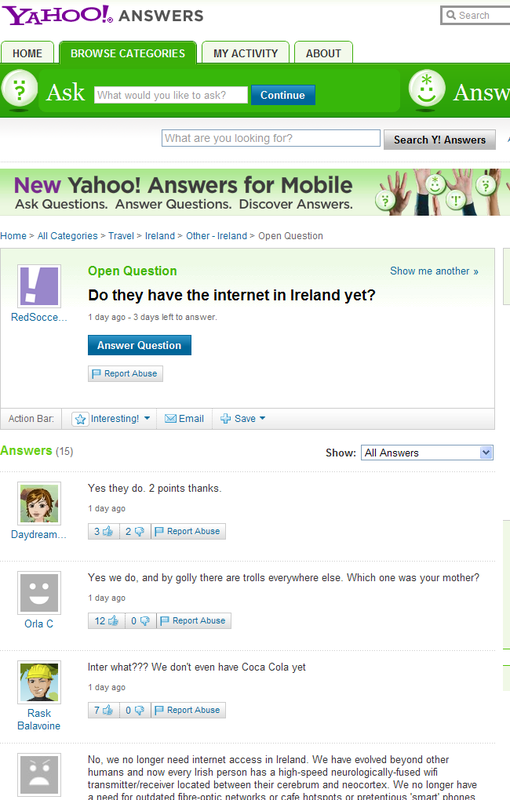 Ireland’s “peediddy” replied, “No, we no longer need internet access in Ireland. We have evolved beyond other humans and now every Irish person has a high-speed neurologically-fused wifi transmitter/receiver located between their cerebrum and neocortex. We no longer have a need for outdated fibre-optic networks or cafe hotspots or pretentious 'smart' phones. I didn't even use any hardware to post this answer here, I just imagined Y!A and thought about the words and hey presto! they appeared like magic. Internet? how quaint! Just for the record, 65.8 percent of the Irish population uses the internet, up from 20.9 percent in 2000. To put it in perspective, Ireland’s degree of internet penetration outranks the European average (58.4%) and such countries as Italy (51.7%) and Spain (62.6 %), while trailing France marginally (68.9%), but falling short of Germany (79.1%), UK (82.5%), and European leader Iceland where 97.6 percent of the population online. The comparable U.S. figure is 77.3 percent. Ireland is also home to a lively web development sector and a vibrant blogging community, so we’ll try to tell some of those stories in posts to come. In the meantime, why don’t you have some fun--log onto Yahoo! Answers in the next couple of days and add your response to “Do they have the internet in Ireland yet?” Extra points for creativity!